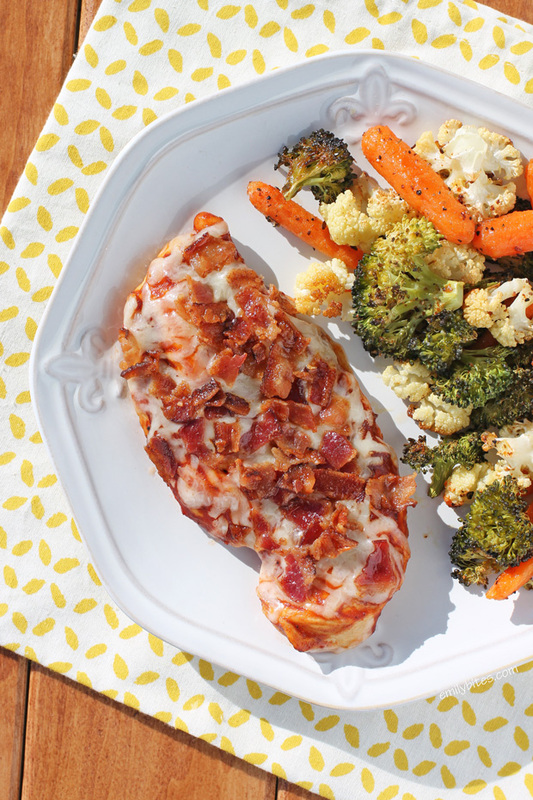 This Cheesy Bacon BBQ Chicken is so easy and SO good. 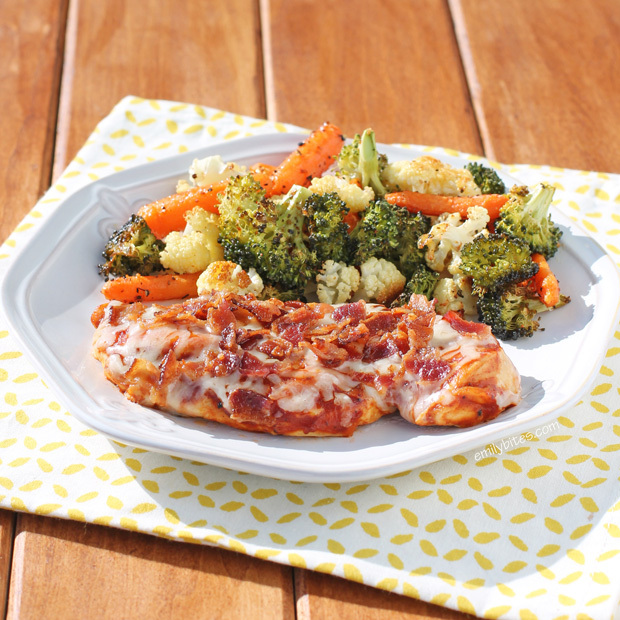 I love when so many of my favorite flavors come together into one dish, and juicy chicken slathered in savory barbecue sauce and topped with melty sharp cheddar and crispy bacon certainly qualifies. We eat a ton of barbecue chicken in the Summer, but since our grill has been covered in snow for a while, this was a great way to get to eat one of my favorite foods. Just a note: the nutrition facts for barbecue sauces can vary dramatically, so the barbecue sauce you use can affect the calories or Weight Watchers points for this recipe. I used Stubb’s Original which only has 6 grams of carbs and 4 grams of sugar per 2 tablespoon serving. Plus, it’s delicious. If you want the nutrition information to stay about the same I recommend looking for a sauce that is similarly low in carbs – it can make a big difference! One more tip, I put the veggies pictured in to roast at 400 at the same time the chicken went in, which is a great way to get a complete meal finished all at once. Just spread the veggies out on an aluminum foil lined baking sheet, drizzle with oil, sprinkle with salt, pepper and other seasonings (I always end up using a mish mosh of things) and put in the oven at 400 for 35 minutes or so until finished. Perfect for a fast and easy weeknight meal! Cook bacon to crisp according to package instructions (I bake mine at 400 for 15-16 minutes on a baking sheet, which leaves the oven pre-heated for the next step!). Crumble the bacon into small pieces and set aside. Pre-heat the oven to 400. Line a baking sheet with parchment paper and set aside. Use a pastry brush to brush the outsides of both sides of the chicken breasts with the olive oil and place them on the prepared baking sheet. Sprinkle lightly with salt and pepper and place in the oven. Bake for 15 minutes. Remove from the oven and flip each breast over. Split the barbecue sauce equally into two small dishes. Using the pastry brush again (wash it in between! ), paint the chicken breasts using half of one dish of the barbecue sauce. Flip the breasts back over and paint the top side with the remaining barbecue sauce from that dish. Place back in the oven for another 5 minutes. Wash the brush thoroughly again before step three. Remove the baking sheet from the oven and lift the parchment paper holding the breasts off of the sheet and set aside. Re-line the sheet with aluminum foil or more parchment and transfer the chicken breasts back onto the freshly lined pan. Discard the parchment paper holding any remaining oil/liquid. You may want to check now to make sure the chicken is cooked through (or almost). Use the remaining dish of barbecue sauce to slather the tops of each chicken breast one last time. Sprinkle the cheese over top of each breast and follow with the bacon pieces. Place back into the oven and bake for another 3-5 minutes until cheese is melted. I thought my husband was going to drool on my phone when I showed him this recipe. Lol Keep up the great work Emily! Your a rock star!!! We had this for dinner tonight it was super easy to throw together!! And I can honestly say this was the most moist and best chicken I’ve had in a long time! Thank you Emily for your wonderful culinary creations!. And keep up the good work! I made this last night and it was delicious!! My husband loved it too. Thanks for another great recipe. I made this the other night and got RAVE reviews from a selective eater! I was asked to make it again next week! It was very easy to put together and very delicious. I have friends that want to try it now. I made the veggies along side and it was the best meal I’ve made from a new recipe in weeks 🙂 Thank you SO much for this wonderful recipe! This was so delicious!!! Hubby said it was a keeper. Thanks for all the great recipes…makes WW so do-able!!!!! I finally made this one last night and it did not disappoint! Cooking times in the recipe were spot on and everything came out great. If you’re a fan of the ingredients you’ll love the way this comes together. A word about the BBQ sauce — make sure you look really carefully at the carbs and sugar!!! If you can’t find Stubs (thankfully I did after some searching), it may be really hard to find one with the right amount of sugar and carbs. WHY do they use so much sugar when Stubs is so delicious without it??? Haha, I agree – I love Stubb’s! Some of the BBQ sauces out there are chock full o’sugar and Stubb’s is perfectly delicious without all that. I’m so happy you loved the recipe! Can you clarify if it is 4 5 ounce breasts or is it 5 ounces of chicken total divided into 4? This is so delicious. I recently found your blog and am so happy I did! I can’t wait to make this again! I just made this recipe tonight. It was fantastic!! So much flavor in so few calories. I can tell this will be added to my go-to list. Thanks for the great recipe!! We had this last night for dinner and it was very good, although a little more time consuming than I prefer. The first round of bbq sauce, the side that was flipped over (on the pan), pretty much all of the sauce came off due to the liquid from the chicken. Also, when it came time to remove the chicken, switch out the parchment paper and put a new one….I understand the reasoning behind it, but its not very easy to just lift off a sheet of parchment that probably has 1/4 cup of liquid from the chicken on it. Next time I will probably just get out a whole nothing roasting pan/cookie sheet, although I would rather have a recipe that didn’t involve the extra steps. We use the Annie’s Organic BBQ sauces because there is no high fructose corn syrup, etc. Thank you for this recipe!! I made this tonight for dinner and it was so quick and easy!! And soooo yummy!! My boyfriend was very happy to have something so good be done in such a quick time lol. I’ve been looking for something that’s actually easy and quick to make for weeknight dinners (oftentimes meals advertised as “simple and fast” don’t end up being so quick for me), and I think I’ve finally found something I can make at LEAST a couple times a month when I need something super easy and fast and YUMMY. This has to be the most confusing recipe I’ve ever seen! Hi Roland, what are you feeling confused by? Sorry, but too many “change the parchment paper” and “clean the brush”… I’m used to straight-forward steps. I had to read this several times to pull out what is actually happening. I know you want to make sure nobody gets sick, but this is too much. I’ll know in a few minutes how good this is – I suspect it’s really good! Made this tonight for the first time…. SOOOOO GOOD!!!! Chicken was so flavorful and moist. Everyone loved it!